Since my travel companion during my recent trip to Andalucía doesn’t speak Spanish, I inevitably spoke mostly English while there. (I’m making up for this by speaking tons of Spanish while grading AP tests in Cincinnati.) Nevertheless, I had as many Spanish conversations with strangers as I possibly could, and also kept my ears open to expose myself, as much as possible, to Andalusian Spanish. I’ve long been academically familiar with Andalusian Spanish, of course, meaning that I knew about its features from reading about them. And I knew that most of these features are shared with Latin American Spanish because, as demonstrated by Peter Boyd-Bowman, the Spaniards who immigrated to Latin America during the colonial period were disproportionately Andalusian. 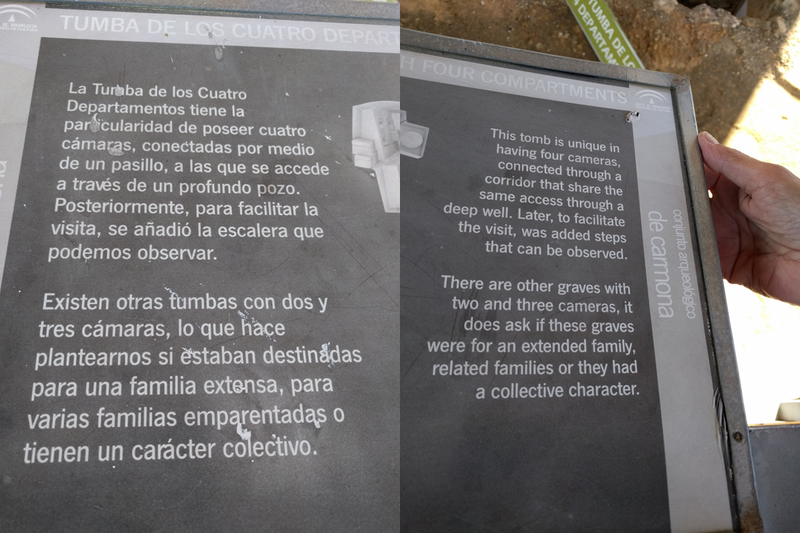 However, it was exciting to hear this kind of Spanish spoken around me in its home territory. The Andalusian feature that means the most to me personally is the tendency to weaken or drop -s sounds at the ends of words and syllables. “Personally”, because my first linguistic research, as a Harvard undergraduate, was on this same phenomenon in Puerto Rican Spanish, and its possible consequences for subject pronoun usage in Puerto Rican Spanish. This research eventually led to an article published in Language, the prestigious flagship publication of the Linguistic Society of America, which as you can imagine was a healthy way to start my career. So every mimo (instead of mismo), gracia (instead of gracias), and so on sounded like a friendly blast from my past. One hazard of dropping your s‘s frequently is that you can forget which words actually have them, and start to make mistakes in your spelling. A case in point is this poem, by María de los Ángeles Martínez González. which we saw set into a wall along a street in Cádiz. 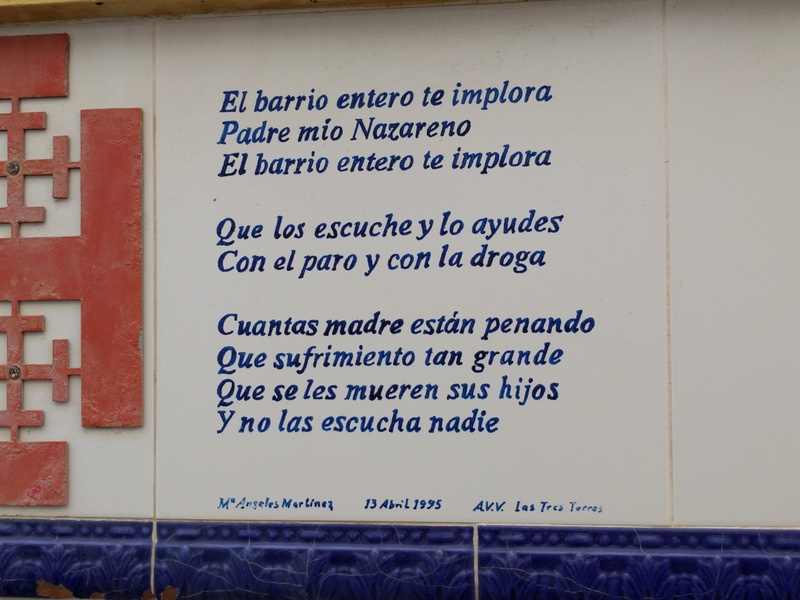 The words escuches and madres were cast in ceramic without their final s‘s, which you can see in this online version of the poem. This linguistic point aside, the poem is heart-breaking. Another common Andalusian feature is the weakening and deletion of the d sound between two vowels. This is actually a downstream version of the historical process of “lenition” that, centuries ago, turned Latin t‘s into Spanish d‘s, and likewise Latin k and p sounds into Spanish g‘s and b‘s (vita > vida, focum > fuego, lupus > lobo). 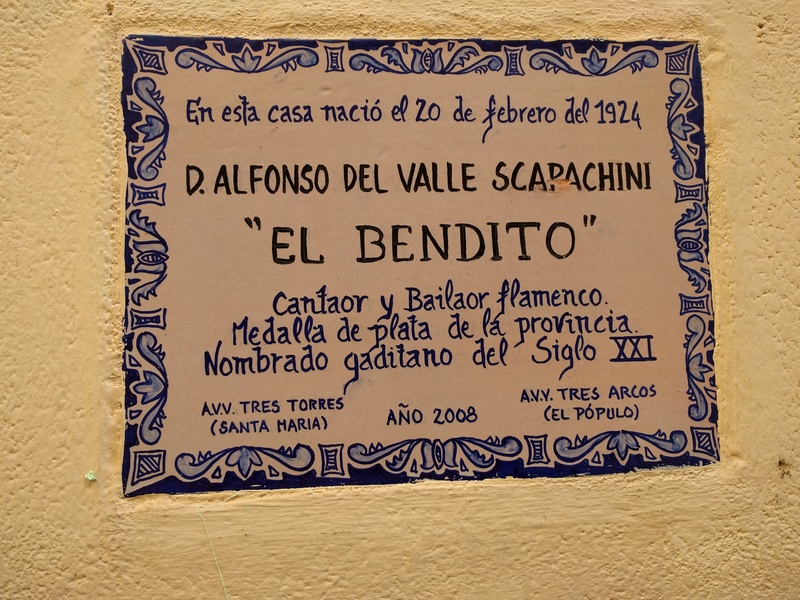 While on the same stroll through Cádiz I did a double-take when I saw what looked like another dialect-influenced spelling mistake on a historical marker memorializing a famous flamenco artist who was both a singer and a dancer: in standard Spanish, both a cantador and a bailador. Here, these two words were spelled without their d: cantaor and bailaor. After seeing the same spellings elsewhere I learned that they are, in fact, the legitimate terms for a flamenco singer and dancer. You can see the corresponding Real Academia dictionary entries here and here. So in this case lenition has gone legit. Two final accentual anecdotes. First, struck by the non-Andalusian accent of one tchotchke seller I was chatting with in Granada, I asked if she was from out of town. She explained that she deliberately neutralized her accent when talking with non-Andalusians. Would you believe there’s a linguistic term for this? It’s called “linguistic accommodation”. Second, when I overheard a family group speaking in what I first thought was Italian and then realized was Spanish, I correctly inferred that they were from Argentina. Spanishlinguist scores! Actually, Argentinian Spanish is a softball dialect to identify…but still fun, especially when you hear it so far afield. This entry was posted in Sounds, Spanish in the world and tagged Andalusian Spanish, bailaor, cantaor, español andaluz, lenition, s deletion on 16 June, 2018 by jhochberg. I’m still thinking about my recent trip to Andalucía. 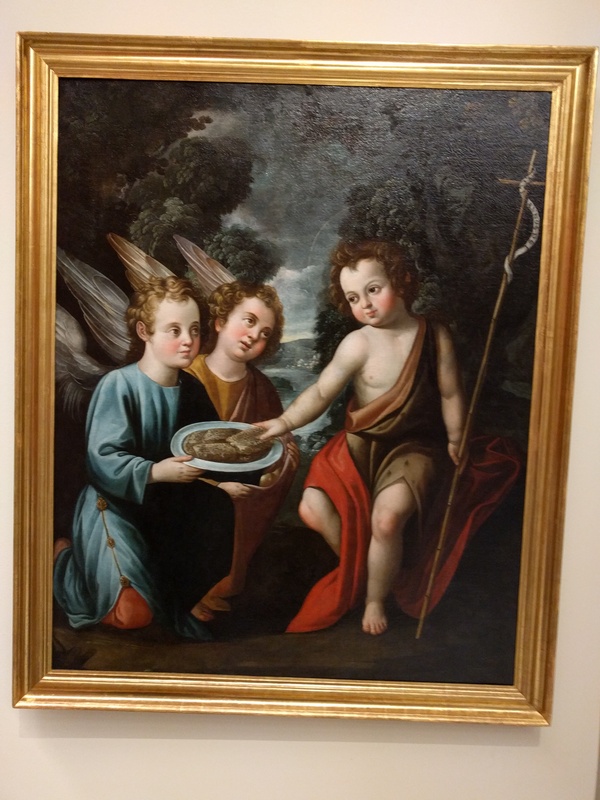 Tonight I’ll share with you a linguistically interesting Latin mistake that I saw at the Museo de Bellas Artes in Seville, in this charming 1640 painting by Juan del Castillo, San Juan niño servido por dos ángeles (‘John the Baptist, as a child, served by two angels’). Hopefully you can see that this inscription reads Ecce annus dei, which translates as ‘Here is the year of God’. This should be Ecce agnus dei, ‘Here is the lamb of God’, a reference to John’s statement Ecce agnus Dei, ecce qui tollit peccatum mundi ‘Look, this is the Lamb of God; look, this is he who takes away the sin of the world’ (John 1:29). Why eliminate agnus in Spanish? 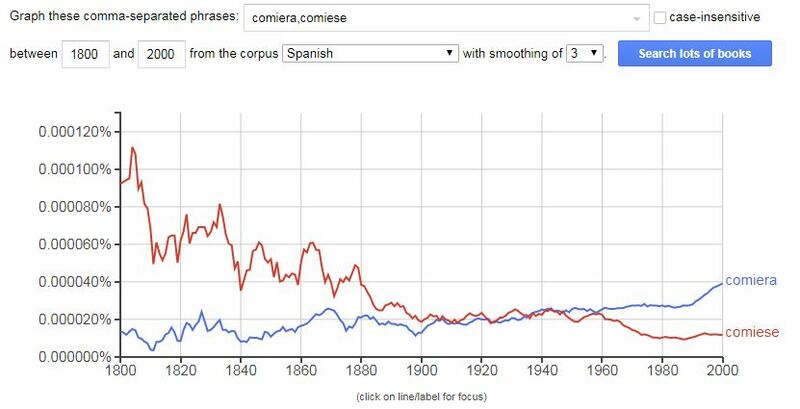 The most likely explanation is that Latin gn and nn both became ñ in Spanish; for example, Latin canna became caña ‘cane’ and Latin ligna became leña ‘firewood’ (see this earlier blog entry for more examples). This means that annus and agnus would both have emerged as año in Spanish once final -us turned into -o, so something had to give. Turning to another root for a new word for ‘lamb’ was a reasonable solution. In contrast, annus emerged with a plain n sound in the other Romance languages, so there was no danger of the two words for ‘year’ and ‘ lamb’ sounding alike. I wonder, in fact, whether Juan del Castillo’s Latin mistake was somehow related to this history. Would a speaker of a different Romance language been as likely to confuse agnus and annus? This entry was posted in Bad Spanish, From Latin to Spanish and tagged agnus dei, eñe, Juan del Castillo, Museo de Bellas Artes de Sevilla on 14 June, 2018 by jhochberg. Long-time readers of this blog know that I’m obsessed with (i) the two forms of the Spanish imperfect subjunctive and (ii) Jordi Sierra i Fabra’s “Inspector Mascarell” series of detective novels, set in Barcelona before and during the Franco era. This post combines these two passions. While in Cádiz during my recent visit to Andalucía, I bought a copy of the tenth novel in the “Inspector Mascarell” series, Diez días de junio. (This was at the Librería Manuel de Falla, named after one of Cádiz’s best-known native sons.) I devoured it over the next few days — and, struck as always by Sierra i Fabra’s frequent combination of the -ra and -se subjunctives within sentences, decided to keep track of all such sentences. The following table lists the fifteen examples I found. The formulaic hiciera lo que hiciese construction (example 3; also see this earlier blog post, and ex. 6 for a counterexample). A single subjunctive-triggering context followed by both an -ra and an -se subjunctive, such as para que (examples 1, 4, 5), puede que (ex. 8), or pedir que (ex. 9). puede que, adjective clause, aunque (ex. 11) — 3 subjunctive contexts in a single sentence! In sentences with one usage each of the -ra and -se forms, half the time the -ra subjunctive came first, and half the time the -se was first. In sentence #11 an -se subjunctive is sandwiched between two -ra forms, while in sentence #6 a single -se form is preceded by four -ra subjunctives and followed by a fifth. The book also contains the intriguing sentence Le detuve en 1936 después de que un niño se SUICIDARA por su culpa. The use of suicidara here apparently violates the rule that después de que only triggers the subjunctive when talking about future events. After some investigating, I’ve come across three possible explanations for this usage. The use of the imperfect subjunctive to mention background information. This usage, often found in journalism, is discussed in Patricia Lunn’s “The Evaluative Function of the Spanish Subjunctive” (in Modality in Grammar and Discourse, eds. J. L. Bybee and S. Fleischman, John Benjamins, 1992, pp. 429-49). However, in this particular example the suicide is new news, not shared background. The use of the -ra imperfect subjunctive as a pluperfect indicative. The -ra subjunctive started as a Latin pluperfect indicative and was repurposed fairly recently, in the Golden Age. One still sees uses of the -ra subjunctive that hark back to its roots, as discussed in this Wordreference Forum thread. Analogy to antes de que. This explanation, also discussed in Patricia Lunn’s paper, makes a lot of sense! Since antes de que always triggers the subjunctive, it’s logical that después de que should, too. 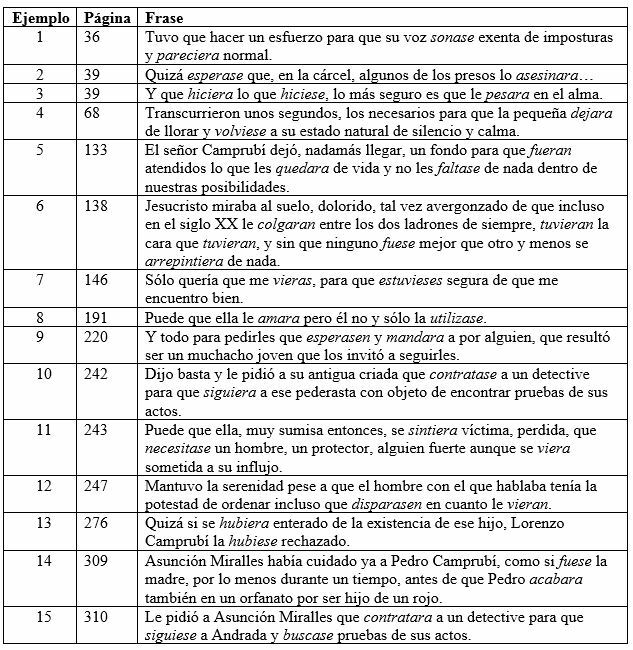 Finally, I am intrigued by the apparent triggering function of lo más seguro es que (example #3). I suppose this is akin to a quizá(s). This entry was posted in Verbs and tagged adjective clauses, adverbial clauses, Diez días de junio, imperfect subjunctive, Inspector Mascarell, Jordi Sierra i Fabra on 31 May, 2018 by jhochberg. 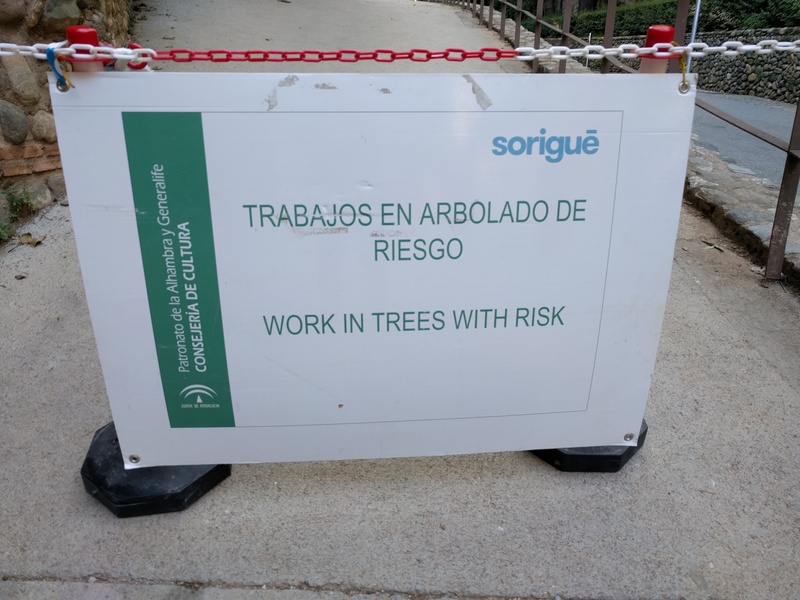 Most of my “Bad Spanish” posts pick on the creators of road signs, shopping cart signs, and commercial packaging — folks whom you wouldn’t necessarily expect to be that adept at Spanish. In this post the “Bad Spanish” culprits should definitely know better. They are the folks in Madrid who sell tickets online for the Teatro de la Comedia, the city’s highbrow venue for classical Spanish theater. 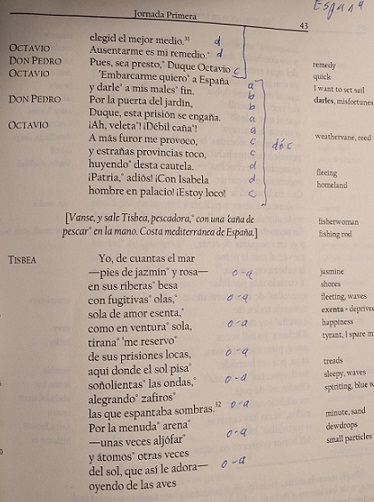 As I mentioned in my previous post, I recently took advantage of a stopover in Madrid on my way home from Andalucía to attend a performance of El burlador de Sevilla, Tirso de Molina’s original (17th century) version of the Don Juan legend. I bought the tickets ahead of time and received them as an email attachment, shown below. 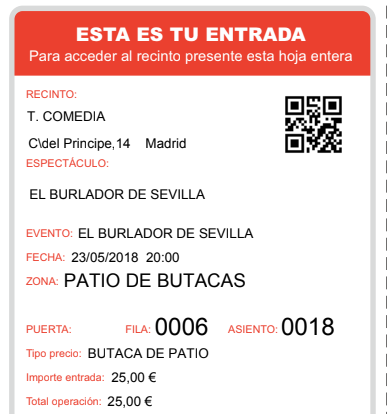 As you can see, the ticket states Esta es tu entrada, using the familiar (tu) possessive pronoun, but then presente esta hoja ‘show this page’ using the formal (usted) command form of the verb presentar. 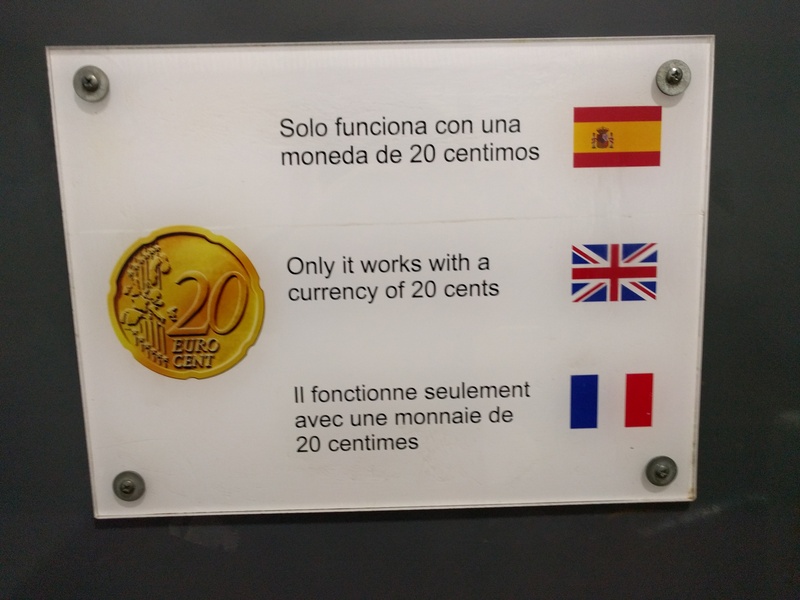 Bad Spanish IMHO! HOWEVER…this tú/usted switch is reminiscent of one I saw in a NYC subway car and blogged about a few months ago, a post that provoked many comments, including two from readers OK with the switch. So to be fair, perhaps it isn’t actually a problem here, and my “Bad Spanish” moniker is perhaps too harsh. I did contact the ticket-selling agency to ask if the combination of modalities was accidental or deliberate, and received a most courteous and thoughtful reply, which I translate below. From the perspective of our office (technical support for ticket sales) we don’t know exactly why this document uses the two different treatments. We’ll consult with the National Institute of Dramatic and Musical Arts to see if there exists a memorandum we can make use of that explains not only the types of texts and their distribution in the document, but also an explanation of the intentions of each text. Personally, the second text (presente) seems more correct to me. It is a request made to the person who has bought the ticket, and it seems to be a basic norm of courtesy to address this person using the usted form. Perhaps in the first text they were aiming for a more impactful message and for this reason chose a different treatment. 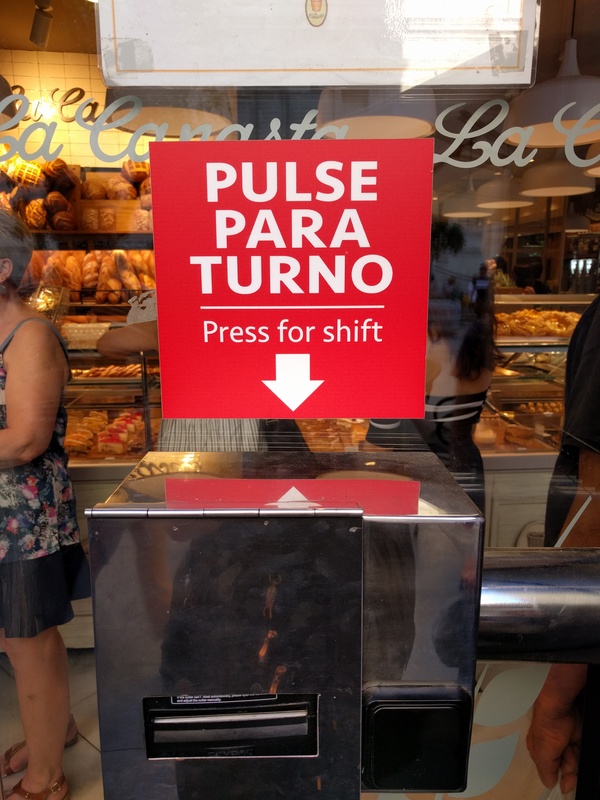 From an anecdotal perspective, the use of tú and usted is a frequent topic of debate in [Spanish] marketing departments. The use of usted is positively associated with good manners and respect but also with a distance to the client, for which reason it’s common to make use of tú in order to attain greater closeness or empathy at the sacrifice of courtesy. In our own www.entradasinaem.es website you can see that we’ve used [informal] suscríbete and únete al inaem, thus linking the informal grammatical treatment with the idea of connecting with our institution. This entry was posted in Bad Spanish and tagged Teatro de la Comedia, tú and usted on 29 May, 2018 by jhochberg. Yesterday I came home from a two-week trip to Andalucía, Spain’s southernmost region, with my consuegra Sue. My previous blog post, written just before our trip, describes our itinerary and includes a map of our route. We went everywhere by train, bus, and foot. Although this was my fifth trip to Spain, I hadn’t been to Andalucía since my first trip, back in 1980 (!! ), when a friend and I visited Córdoba, Sevilla, and Granada after attending a summer-abroad college program in Madrid. I remember loving Córdoba and Granada and getting sick in Sevilla. It was definitely time for a return visit, and Sue was up for a second excursion after our successful tour of northern Spain two years ago. Andalucía is an ideal destination because it combines natural beauty with layers of human history. There is a lot to see and do, and Sue and I had a wonderful time. In fact, the only downside of our trip was the hordes of other tourists who had had the same bright idea. Sue and I share a low-key approach to tourism, and quickly became allergic to the large groups of camera-wielding tourists who thronged the top attractions. We found the omnipresent selfie sticks to be particularly intrusive, and hope that the Spanish Ministry of Tourism will soon follow the lead of the many public and private sites that have banned the devices. Here is a city-by-city summary of our trip, with some of my own pictures and lots of links. I hope to follow up this post with others inspired by linguistic observations during the trip. Without knowing it, we had scheduled our visit to Córdoba to coincide with the city’s annual Fiesta de los Patios, in which residents enter their beautifully decorated interior patios in a city-wide competition. This timing proved more of a nuisance than a blessing, since it brought more crowds into the city, and we didn’t have the patience (or interest) to queue up in the long lines to view the patios entered in the contest. On the other hand, we were happy to take advantage of the free flamenco performances scheduled around the city during the Fiesta. I’ll never forget a midday performance where we were close enough to see the male dancer sweat, and the female dancer lose the flowers out of her hair as she tossed her head passionately. We learned that flamenco refers more to music than to dance; in fact, a nighttime performance we saw at the Plaza de la Corredera had only singing (with guitar accompaniment) and no dancing. In Córdoba the main attraction is the grand Mezquita, or mosque, whose forest of red-and-white striped columns is now interrupted by a cathedral. The Mezquita was one of the highlights of my 1980 trip and it was exciting to see it again. It is a popular attraction, so crowd avoidance was a priority. 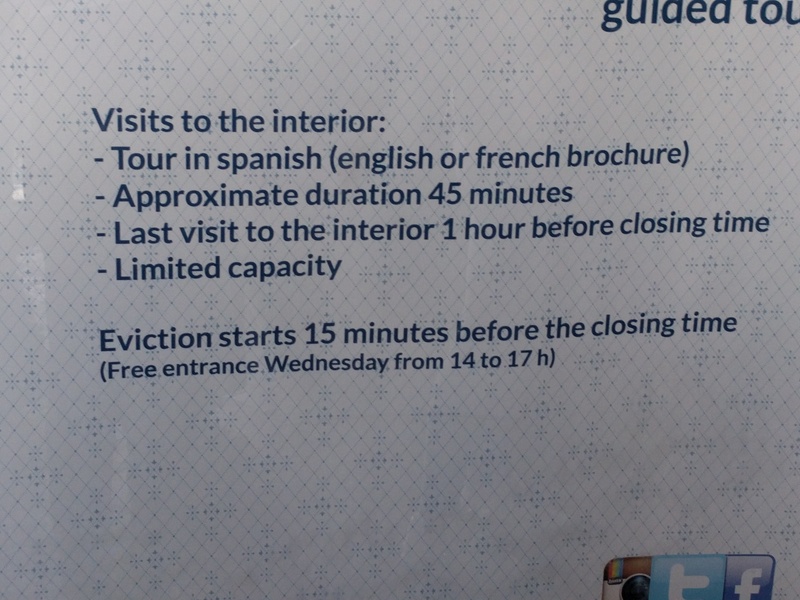 We stayed at a modest hotel right across the street from the Mezquita and made sure to queue up for the 8:30 am opening. Another major attraction, substantially less crowded, is the Alcázar de los Reyes Cristianos. This fortress/palace features beautiful gardens, but we were most interested in some objects displayed inside: a stunning (and huge) Roman sarcophagus — note that its carved doors are ajar — and a group of mosaics from a Roman McMansion that were only discovered in 1959, when the ground under the nearby Plaza de la Corredera was excavated in order to refurbish the market. What a gorgeous surprise! 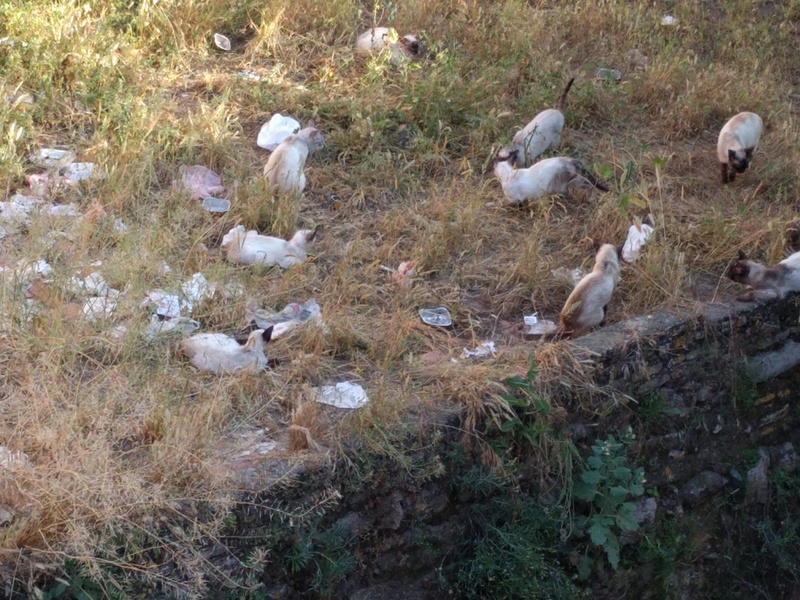 I recommend also a stroll along the Guadalquivir river, where you will see outdoor bars, wheels from ancient mills, and feral Siamese cats. Our favorite place to hang out, though, was the Kurtuba Gastro Bar, where one can relax and enjoy excellent salmorejo (a thick cold tomato soup, quite distinct from gazpacho) and perfect croquetas while admiring the resurrected columns of a Roman temple across the plaza. I was especially looking forward to Sevilla because I’d basically missed it the first time around due to illness. The city did not disappoint. Its two main attractions are the cathedral and the Real Alcázar. We bought tickets ahead of time for the Alcázar and spent hours exploring the gorgeous rooms and gardens. It was a perfect marriage of natural and man-made beauty, and likewise a felicitous combination of Arabic and later styles. The cathedral was impressive, especially Columbus’s tomb, and we enjoyed the hike up the Giralda tower, except for the crowds and selfie sticks. From an academic perspective, my favorite destination in Sevilla was the Archivo de las Indias, located between the two other sites. This houses Spain’s official records of the colonial period. The ground floor has a permanent exhibition of some of the institution’s treasures, including the original Treaty of Tordesillas, which divided the New World between Spain and Portugal, and the “Capitulación of Santa Fe”, the contract between Christopher Columbus and the Catholic monarchs Ferdinand and Isabella. It was amazing to see these precious documents up close. We stayed at the lovely Hotel Simón, down the street from the Cathedral, and had our breakfasts and one lunch at La Canasta bakery/café just across the street from the Cathedral. This is a Spanish chain similar to Panera and thus somewhat immune to being touristy. I obviously disagree with the negative reviews you see in that link. Sue and I both wanted to spend a night at a parador — a government-run luxury hotel — and so backtracked slightly on the road to Córdoba to stay at the one in the small town of Carmona, which my Top 10 guide book described as “one of the most impressive of all paradors”. For centuries Carmona’s hilltop setting gave the town a strategic importance, and the parador is located on the top of that hill, cheek-by-jowl with the ruins of the town’s Alcázar. 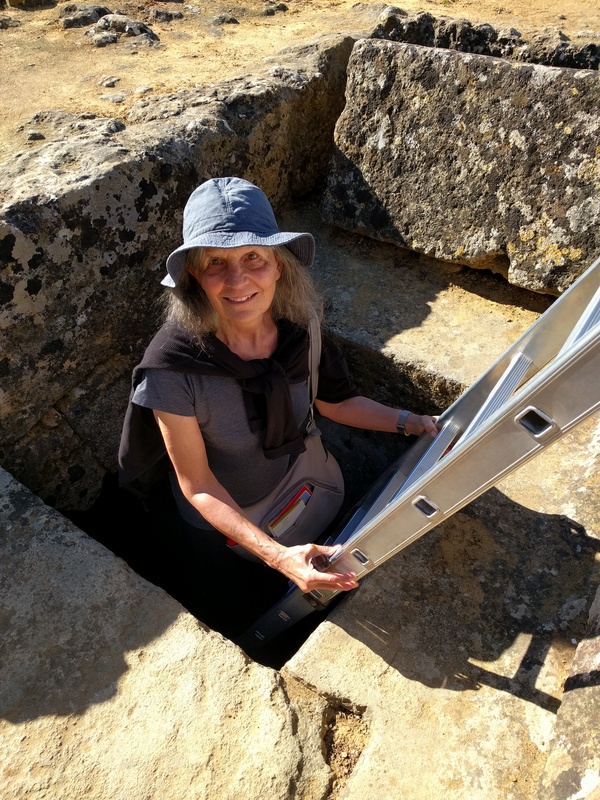 Besides swimming in the inn’s outdoor pool, and sipping sherry at sunset on the terrace while admiring the view, we had a hard-working touristic morning exploring the Roman necropolis, located a ten minutes’ walk from “downtown” Carmona. This was one of the most interesting Roman ruins either of us had ever seen, and was amply signed and interpreted, with a museum housing the relics found in the tombs, including a carved elephant (!). We happened to be at the necropolis when a group of schoolchildren were visiting. They were treated to an educational re-enactment of a gladiator fight, and so were we. The parador wasn’t expensive (it was cheaper than our digs in Cádiz), and we both thought that if you had a rental car it would be a great jumping-off point for a longer stay, with day trips to Sevilla and Córdoba as well as hikes in the countryside. Not to mention swimming and sherry. From Carmona we took the bus back to Sevilla and then a train to Cádiz, an ancient city with a strategic peninsular location on the Atlantic. Here we rented an apartment and settled in for two nights. During the day we dipped our toes in the ocean at nearby Caleta Beach, saw a really cool camera obscura built into an old tower, and walked all over the city. It’s a small town so you can get to know it fairly well in just a day, although a longer stay would be fun in beach season. The hilltop town of Ronda lies between Cádiz and our final destination of Granada, so we spent a night there at the fabulous little Hotel Ronda (our favorite lodging during the trip). Ronda is famous for its gorge and bridges. We basically spent half a day exploring the east side of the gorge, including the Arab baths and the rose garden, and half a day exploring the west side, hiking down into the gorge. We also had the best food of our trip at Casa Mateos. Granada’s main attraction is the Alhambra complex, containing the Palacios Nazaríes, the Alcazaba fortress, the Generalife summer palace, and many gardens. Based on my previous trip to Andalucía we decided to visit the Alhambra twice, and this turned out to be a wise decision as the complex is so large and the crowds are daunting (despite timed tickets for the Palacios Nazaríes). The first day we visited the Palacios, a bit of the gardens, and the Alcazaba, which has fabulous views. We also enjoyed tea on the terrace at the parador, which has great views of the Generalife. The second day we explored the Generalife, where we had an illegal picnic on a bench in the gardens, and spent about an hour at the excellent museum within the Alhambra complex. 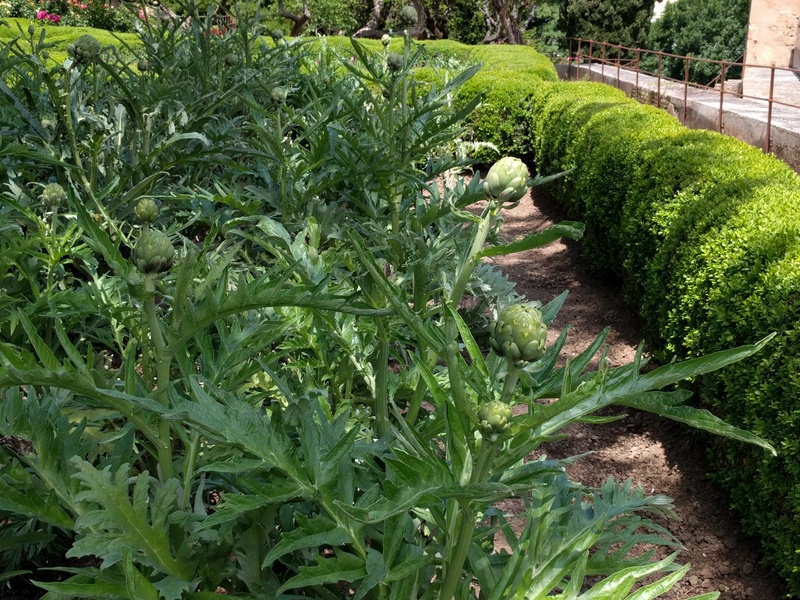 Here’s a picture of some happy artichokes growing in the Alhambra gardens. We rented a comfortable and light-filled apartment across the street from the Cathedral — two thumbs up for Casa de la Lonja! We bought food at the nearby Corte Inglés department store’s supermarket (tortilla española, gazpacho in a milk carton, flan, passable paella, excellent wine selection) and at the traditional market near the Cathedral. Two specific sites I recommend besides the Alhambra are the Monasterio Cartuja, about a half hour walk from the Cathedral, and the Capilla Real adjacent to the Cathedral. The Monasterio features an over-the-top baroque chapel. Given how austere the monks’ lives were in general, entering the chapel must have been a daily shock to the senses. The monastery also features vivid (and sometimes gory) paintings by Juan Sánchez Cotán, a former painter of still lifes (I saw one in the Prado) who joined the order in his 40s, changing his life and his subject matter. The Capilla Real houses the bodies of the Catholic Monarchs (Isabella and Ferdinand) and Isabella’s personal art collection, which included paintings by Botticelli, Van der Weyden, Memling, and other masters. Not too shabby. As a lover of all things Spanish who happens to be a modestly observant Jew, I usually don’t have any difficulty reconciling these two passions. But when I entered the Capilla Real and saw the tombs of Ferdinand and Isabella, I felt a wave of intense anger over what these leaders had done to my people back in 1492. Religion leads people to do the most awful things. 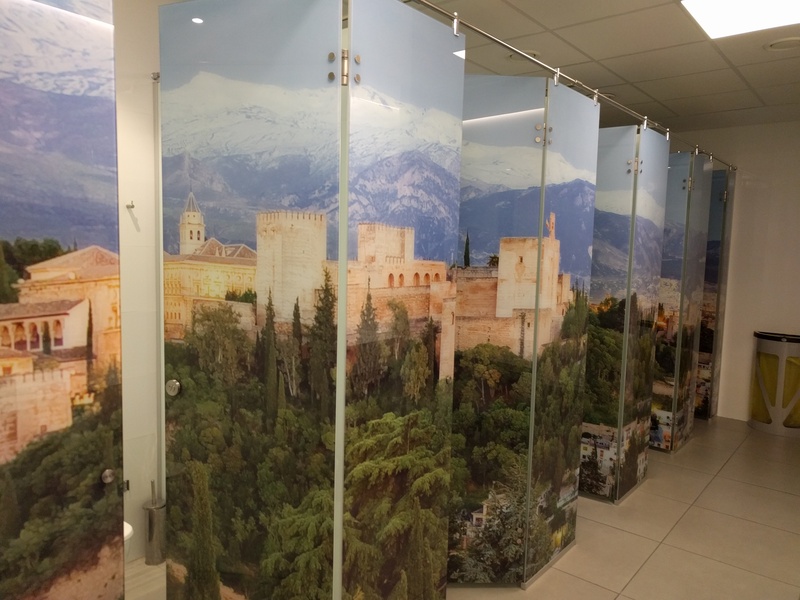 Sue and I flew from Granada to Madrid (the photo at the top of this blog is from the bathroom at the Granada airport), and I had a brief stopover in Madrid before flying home the next day. This gave me enough time to visit my favorite paintings at the Prado and the Thyssen-Bornemisza (no time for the Reina Sofía), walk through the Plaza Mayor and the Puerta del Sol, and attend a performance of El burlador de Sevilla, the original Don Juan play, first performed five hundred years ago and still going strong. On my next trip I want to visit Asturias, and perhaps other northern destinations I’ve never seen, such as Santiago de Compostela, San Sebastián, and Bilbao. And something of the Pyrenees. Yikes! 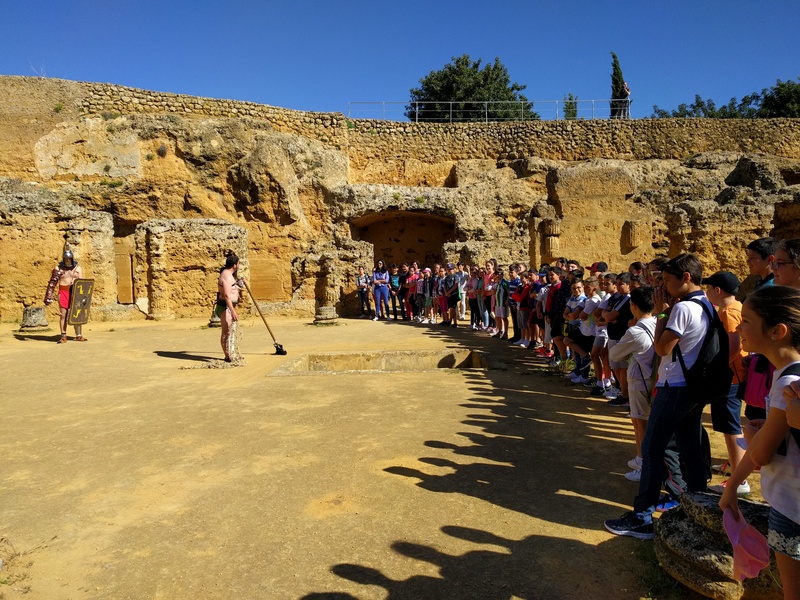 This entry was posted in Linguistic tour of northern Spain and tagged Alhambra, Cádiz, Córdoba, Granada, Mezquita, parador, Ronda, Sevilla, Seville, Spain, tourism on 26 May, 2018 by jhochberg. Two years ago, my consuegra Sue and I spent two weeks touring northern Spain, following an itinerary inspired by my research on the history of the Spanish language. On Friday we’ll meet up again in Córdoba to launch a two-week follow-up trip of Andalucía (southern Spain). This trip is purely touristic, though of course I’m looking forward to hearing Andalucían Spanish. Also, while in Seville we plan to visit the Archivo de Indias, which houses the records of the Spanish colonial period. It was Peter Boyd-Bowman’s research on these records that proved the Andalusian origin of Latin American Spanish (see Ralph Penny’s A History of the Spanish Language, p. 26). 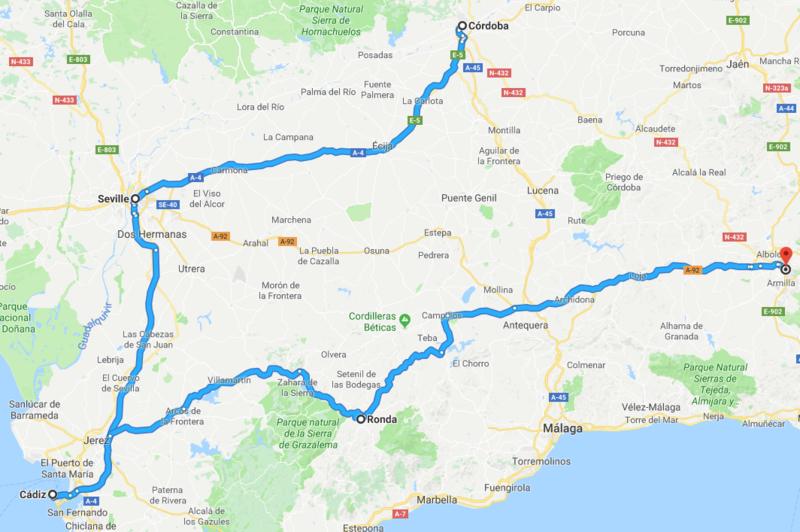 This map shows our itinerary, looping counter-clockwise from Córdoba through Sevilla (the regions’s capital), the important port city of Cádiz, and the famous hill town of Ronda, ending up in Granada (poorly indicated on this map for some reason), where I’ve pre-purchased tickets to visit the Alhambra. Twice. You can’t see it on the map, but after Sevilla we’ll double back to spend one night in Carmona, a small town on the road to Córdoba (you can just see it to the right of the “A-4” marking east of Sevilla), so we can stay at its beautiful parador. When I get back from Spain I’ll be hitting the road inside the United States: attending a wedding in Maryland, visiting grandkids in Philadelphia, touring Yosemite, visiting family in Salt Lake City, and grading Spanish AP tests in Cincinnati. I don’t expect to be blogging during these travels, so most likely you’ll hear from me again in late June. Wish us a ¡Buen viaje! 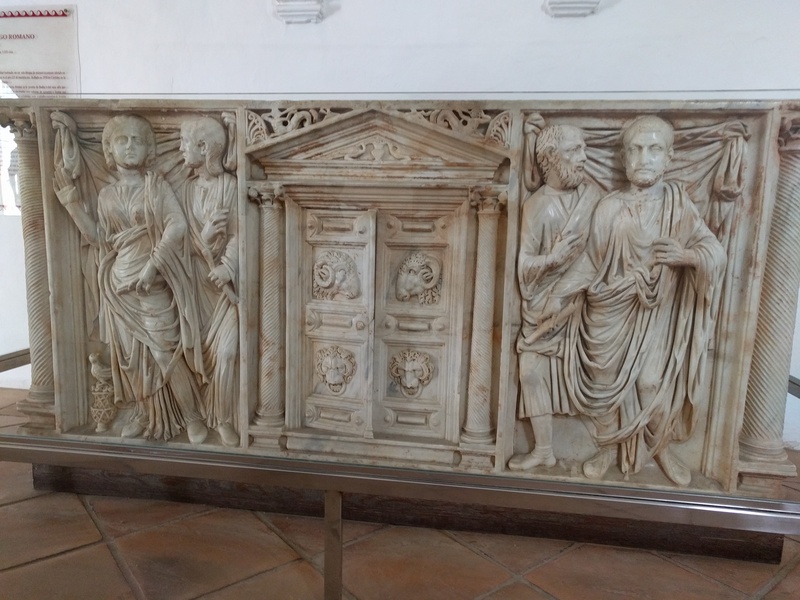 This entry was posted in Linguistic tour of northern Spain and tagged Archivo de Indias, Cádiz, Carmona, Córdoba, Granada, Ronda, Sevilla, Spain on 7 May, 2018 by jhochberg. Regular readers of this blog know that I’m obsessed with the two different versions of the Spanish imperfect subjunctive. This is the verb form that you see in sentences like Quería que Miguel estudiara más ‘I wanted Michael to study more’. This -ra form is more common in general, but it’s equally acceptable to use forms with -se, in this case estudiase. The -ra and –se imperfect subjunctives are both understood around the Spanish-speaking world; their relative frequency varies according to dialect. 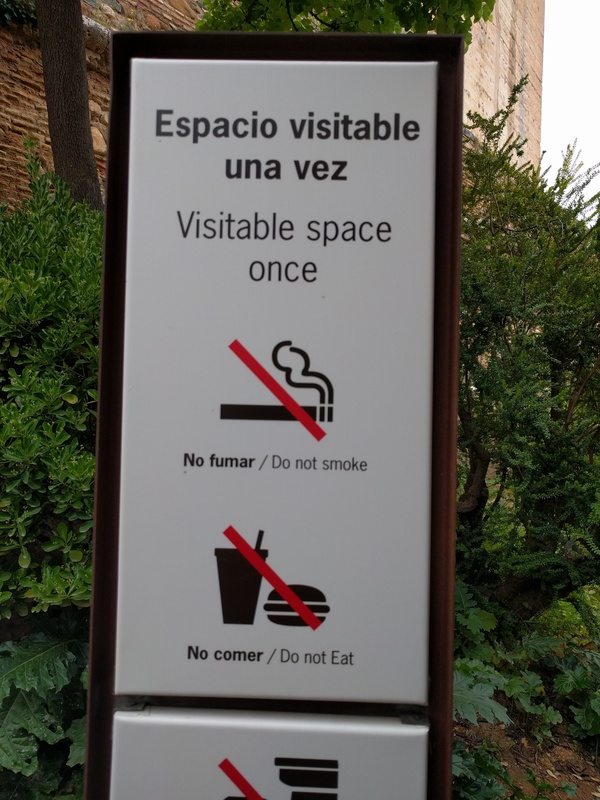 This aspect of Spanish is interesting for two different reasons. First of all, it’s extraordinarily unusual for a language to have such “twin” forms in the heart of their grammar. I haven’t been able to find a single other example after searching the linguistics literature for over five years. Second, neither of these forms is a direct descendant of Latin’s own imperfect subjunctive. 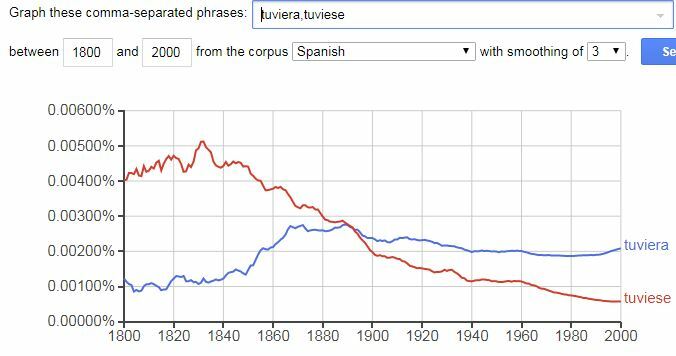 Rather, two other existing conjugations were “repurposed” as imperfect subjunctives: the -se version in Old Spanish, and the -ra form more recently, in the time of Cervantes. 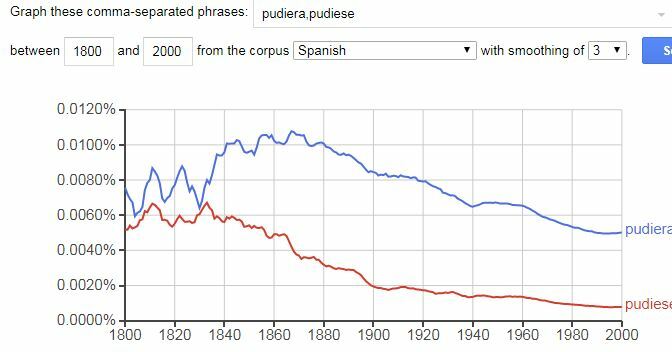 Google Books’ “Ngram Viewer” provides an easy way to see the newer -ra subjunctives overtaking the older -se forms. Google has digitized over 25 million books in English, Spanish, and other languages. Their free “Ngram Viewer” tool analyzes word frequencies in this corpus, making it easy to compare frequencies of two or more words over time. In this post I’ve reproduced six graphs comparing -ra and -se subjunctive frequencies over the last two centuries. The first three graphs (one above, two below) show historical frequencies for the two forms of the imperfect subjunctive for the common irregulars tener, haber, and poder. The remaining three graphs show frequencies for the three regular verbs often used to illustrate Spanish’s -ar, -er, and -ir noun classes: hablar, comer, and vivir. In every case you can see the innovative -ar forms come from behind — or, less often, from parity — to overtake their -se twins. This happened earlier for the irregular verbs than the regulars; I don’t have a theory about why. Keep in mind that written language is relatively conservative, so it’s safe to assume that -ar actually made its move somewhat earlier than shown in these graphs. 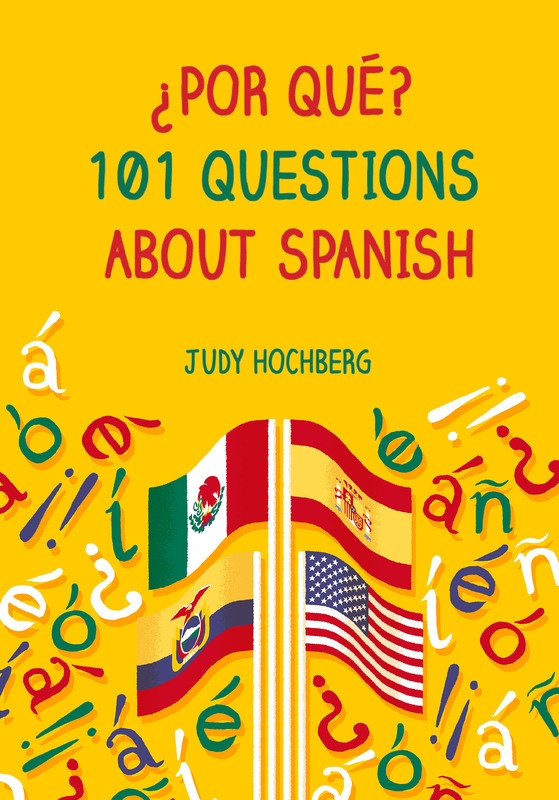 This entry was posted in Verbs and tagged Google Books, history of Spanish, imperfect subjunctive, ngram viewer, ngrams on 18 April, 2018 by jhochberg. If I had a dime for every time I crossed out an extra l from a student’s spelling of inteligente…well, I’d have a lot of dimes. Same for an extra l in mochila (undoubtedly influenced by English words like Godzilla and gorilla), or an extra s in profesora. Add in a few nickel penalties for students who pronounce leer like (King) Lear, and I could treat myself to lots of Starbucks. 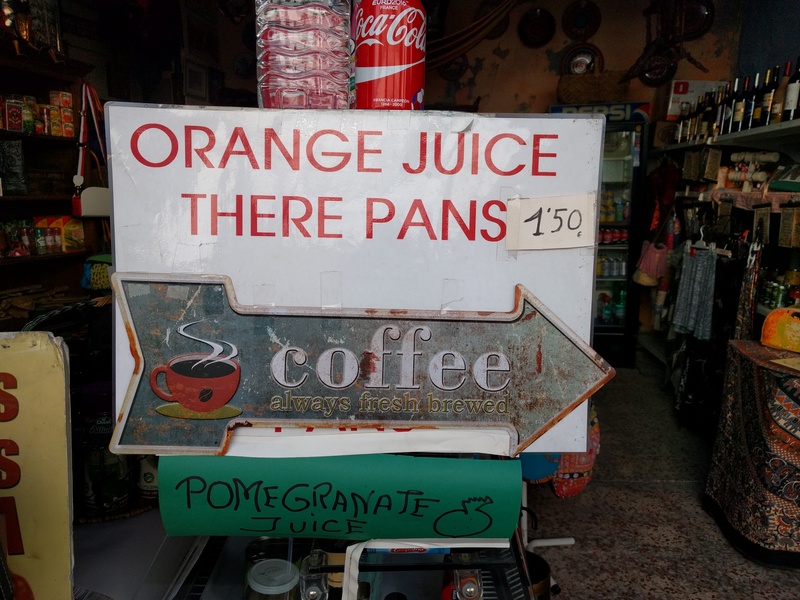 These spelling and pronunciation errors are both triggered by a significant difference between Spanish and English spelling: in Spanish, almost every letter is pronounced. (Notable exceptions include the silent h (as in hola) and the u seen in qui, que, gui, and gue sequences, as in quiso, queso, guiso, and guerra.) This means that inteligente and mochila only need one l to represent the spoken /l/ sound, profesora only needs one s, and the two e‘s of leer must be pronounced individually. Double oo‘s exist also, as in cooperación, and again both vowels are pronounced. This rule also explains why Spanish spelling preserves the double nn in words like perenne, connotar, and innato. According to the Real Academia Española (RAE) these words are pronounced with a long n. While some native speakers I’ve checked with say that they pronounce nn words as if they had a single n, you can certainly hear long pronunciations: for example, here. My (2010) edition of the RAE’s Ortografía de la lengua española also refers to double bb‘s. I had never heard of this combination until I opened the book to check up on the nn words. Moreover, the RAE’s three examples — subbético, subbloque, and subboreal (see below) — are so obscure that they aren’t even listed in the RAE dictionary! (This tickles my funny bone.) So I’m not going to lose any sleep over them. Also in keeping with this rule, Spanish simplifies most double letters in loanwords; the Ortografía gives the examples of driblar (from dribble), chófer (from chauffeur), and zigurat, inter alia. We all know that Spanish spelling is phonetic, but these exceptions make it a little less so. This entry was posted in The written language and tagged double consonants, geminate consonants, geminates, nn in Spanish, Spanish, Spanish loanwords, Spanish spelling on 11 April, 2018 by jhochberg.